If you decide to give your CH kitty a smooch under the mistletoe this year, just make sure she doesn’t reach up to take a bite out of it! 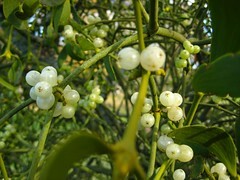 Mistletoe: Eating this plant’s berries or leaves can lead to severe gastrointestinal, cardiovascular and neurological issues including low blood pressure, low heart rate, breathing problems, collapse and more. If enough is ingested, it could be deadly. Holly: This classic holiday plant’s berries and leaves are toxic, again leading to stomach troubles, lethargy and drooling. Christmas Cactus: Although the flowers aren’t toxic, the leaves will irritate your cat’s stomach, causing vomiting or diarrhea. Amaryllis: This beautiful flower (and its stalk and bulb) can lead to vomiting, diarrhea, abdominal pain, lethargy and tremors in cats and dogs. Lilies: Same goes for these flowers; even a small bite of the plant can harm your cat. Symptoms include vomiting, diarrhea, arrhythmia and convulsions. Christmas Trees: Bummer, right? Specific trees that are known for causing stomach troubles in cats include the Australian, Norfolk and Norfolk Island Pine. Fir trees can also cause mouth and stomach irritation, drooling and vomiting. Regardless of variety, a Christmas tree’s needles can also cause your cat great pain if ingested. Experts also warn pet parents to keep their cats away from a tree’s water, which may contain mold, bateria and fertilizers from the tree. Poinsettia: This one has received a bad rap over the years (it’s not actually deadly to cats), but it’s not entirely safe, either. Eating any part of a poinsettia can lead to vomiting and oral irritation. Ideally, experts suggest that we don’t risk the possibility of our cats taking a nibble, and instead opt for plastic plants. However, you may have other options. If your CH kitty is limited to the floor and can’t jump or easily access tabletops, etc., place your plants on plant stands, bookshelves, your dining room table, buffet — you get the idea. Just keep them off the floor and out of reach. If your cat can reach those places, it may be safest if you opt for no holiday greenery or seriously consider artificial plants and tree. However, if you’re dead set on having a poinsettia or receive one as a gift, try hiding it in your bathroom or a closet whenever you can’t supervise your cat. If you think your pet has taken a nibble, contact your local animal poison control center or animal ER. Remember, smaller pets are more likely to be impacted, so watch them all closely! Do you like to have festive plants out around the holidays? How do you make sure that your cat doesn’t nibble on them? 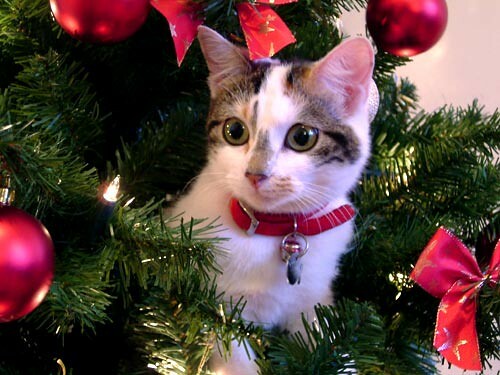 Does your cat bother your Christmas tree? Please share in the comments!